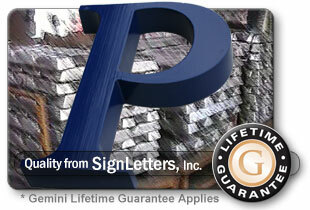 Cast Aluminum letters (Alloy #514) with a professional automotive-type hardened finish in your choice of color. Once your aluminum letters are cast from prime ingot , sanded, blasted, and inspected, the aluminum letters are then finished with a hardened paint finish to provide a very durable and beautiful letter. Both standard colors and custom paint colors are available. Using any custom matched paint colors will incur a color matching fee. Lettering supplied with these professional quality finishes will not fade, crack, peel, etc. - Guaranteed. You can request color matching by use of a PMS reference number or by refering to most paint manufacturer's colors (PPG, Sherwin Williams, DuPont, etc.) - additional paint charges will apply, however we can meet this requirement.